I find it so comforting to walk in the house at the end of a long day and smell a yummy dinner cooking. I love using a crock pot but find some recipes take additional steps like browning and adding ingredients at different time, which defeats the purpose. Some, especially those with potatoes and ground meat, end up in a mush that all tastes the same with no distinct flavors. A friend of mine gave me this pesto recipe about 25 years ago. 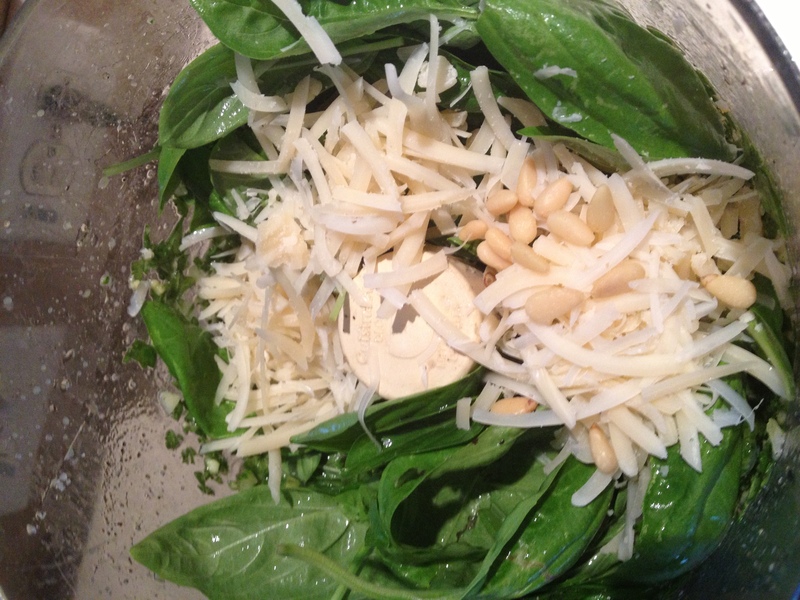 Most pesto recipes have the basic common ingredients; basil, pine nuts, olive oil, garlic, and parmesan…… but I have found that the amount of each makes all the different in the final product. I grow basil in my yard all summer. I wait until they get a lot of new growth and keep snipping off the flower to keep it growing. When it is full and has a bunch of new growth I begin the process of cutting it off and making pesto. I go through the process all summer; grow, snip flowers, cut, make pesto. I save jars and use them for the final product. I stick the jars in the freezer and pull one out throughout the year. Put it all in a food processor and process until desired consistency. I usually pour the oil in as it is processing and stop when I see it get the way I like it. You need to experiment. Growing basil and making your own pesto is well worth the little work it takes. Every Italian dish you make will become awesome! Wondering what to do with that chicken breast on Wednesday night???? Done! Enjoy and hand it down! So maybe you are eating low carb and losing weight, but you are now stuck in a rut of eating the same things and missing some of your favorites. 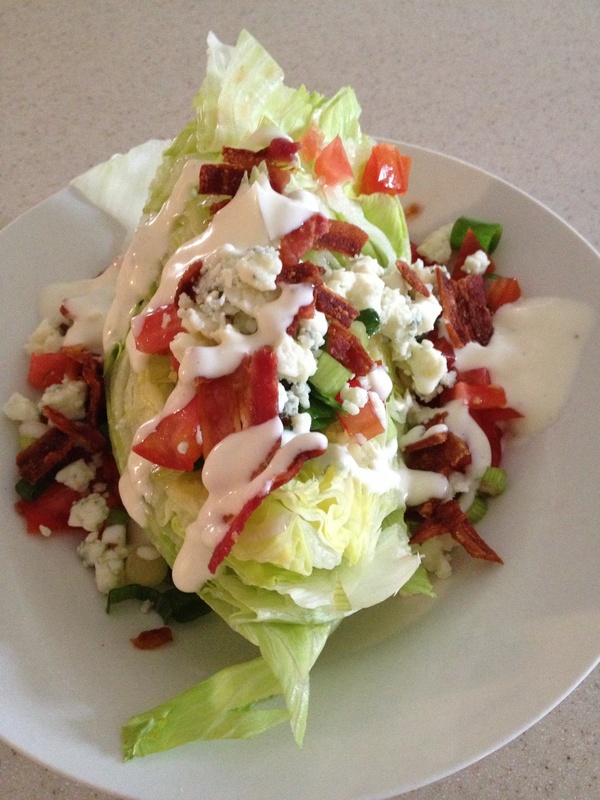 The Wedge salad is a standard at nice steak houses and is quickly made at home. It will make you feel like you are really indulging. If you don’t like blue cheese, just add some ranch. You can also add chopped hard boiled eggs. This salad has ZERO carbs. I served it last night with salmon cooked on the grill and a large Portobello mushroom stuffed with tomatoes and cheese. NO carbs, all yumminess!!! I love pizza and hot sandwiches. 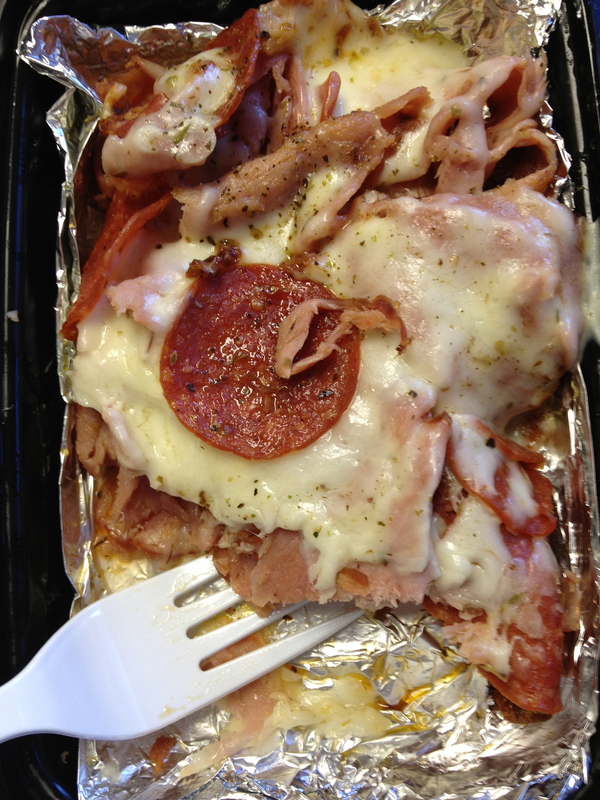 If you are like me, you can still get your “fix” and stay low carb by stacking the ingredients that are inside a sandwich or on top of a pizza. I don’t miss the bread or crust at all and get all those great flavors that I crave. This is my favorite smoked turkey and avocado panini. 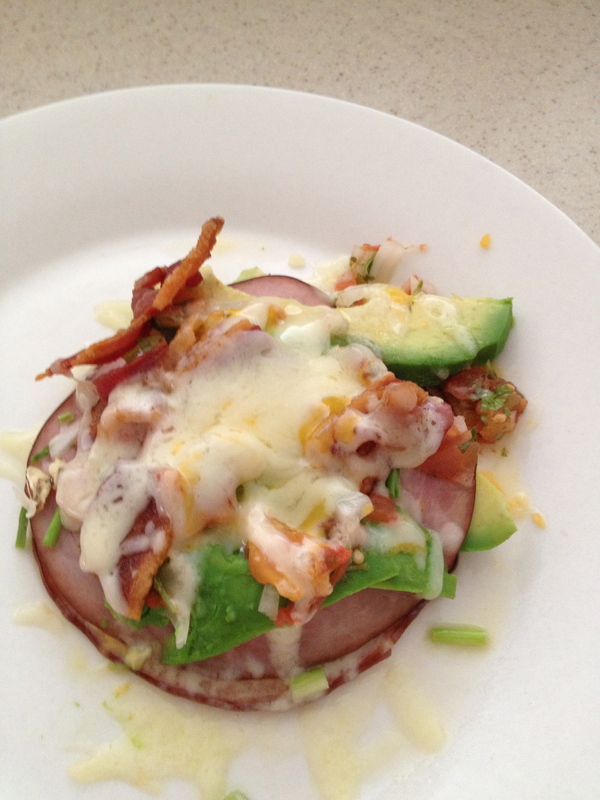 I just stack the turkey, provolone cheese, and avocado as high as I want, top with bacon and more cheese, then broil. I get all the yumminess with out the carbs. This is a “pizza stacker” that I made on foil and broiled until bubby. I stacked uncured pepperoni, cheese, oregano, pizza sauce, and canadian bacon them repeated ending with cheese. I even have the cooks at my work cafeteria broil the insides of sandwiches or pizza toppings on the day they are serving them. Try it! You don’t have to give up your favorite flavors to go low carb. So I keep berries as part of my pantry list. I put them in salads, smoothies, and fat free greek yogurt. I picked up this great tip on Pinterest, tried it, and it really works. Soak your berries in a vinegar/water solution. 1 part vinegar to 10 parts water. Slosh them around and let them set for around 15 minutes then drain water, pat dry and put in a container in the frig. The berries will keep longer and won’t develop mold so quickly. The vinegar kills the mold spores. I had some strawberries last 2 weeks as well as some blackberries. I hate it when I spend the money to bring home berries and in 3 days they have mold on them! 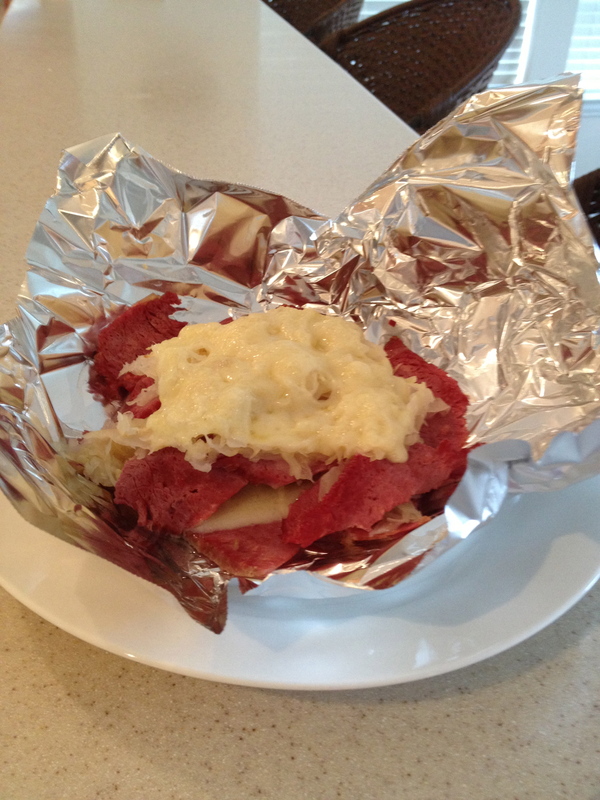 Looking for a yummy, low carb, option for the grill this summer? Throw these bad boys on! 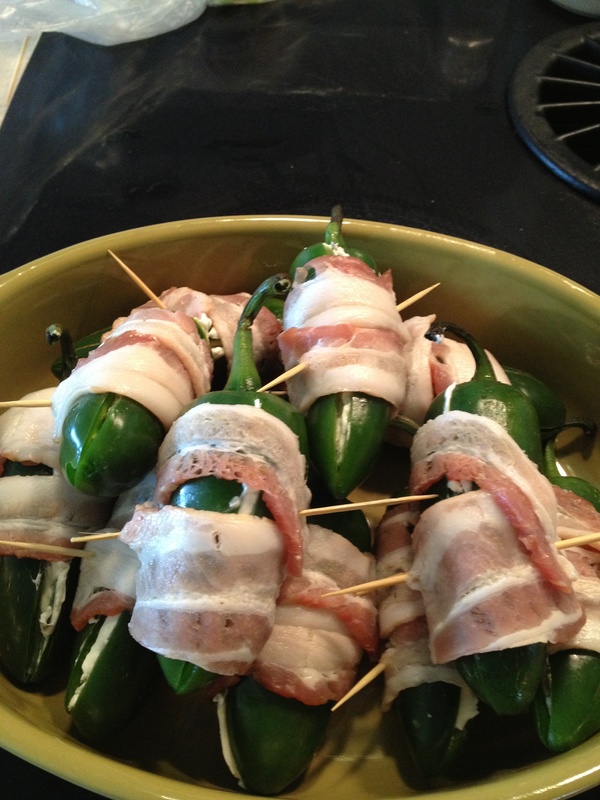 Cut a slit in the jalapenos, clean out the seeds (or not), fill with cream cheese, wrap in bacon, and stick with a toothpick. I wear rubber gloves when cleaning out the seeds. Grill until bacon is done. I can never make enough of these. Enjoy, and hand it down! Week two went very much like week one, but I didn’t take a Freebee Friday. Carbs average was 75 g for the week and calories average was 1458. Remember, I am not counting calories, but feel they are staying pretty low because I’m not “dieting” and I don’t feel hungry. Worked out 4 times 30 minutes each time. I did a combination of tread mill, weights and some crazy free dancing! I love butter, but found ghee is better for me. So I started using that for the first time. You don’t need crust to enjoy pizza, just stack the ingredients like a lasagna and bake. All the yummy flavor is there. I drank wine. Enough said, really. Going to keep it the same and will update again on this page. I hope you will join me and have picked up a couple of books from the Good Reads section at the bottom of the page. 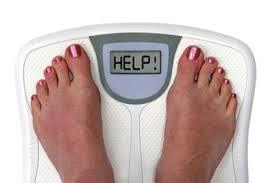 They will change the way you think, if you are a carb-o-holic and change your body too. Stay tuned! So What The Hell Do I Eat Now? Yeah, I know. You cut out all the white carbs and are starving! What do I eat now? If you love snacking or are not sure what to serve at a party that you can eat, here is my go to appetizer. The deli meats are uncured. 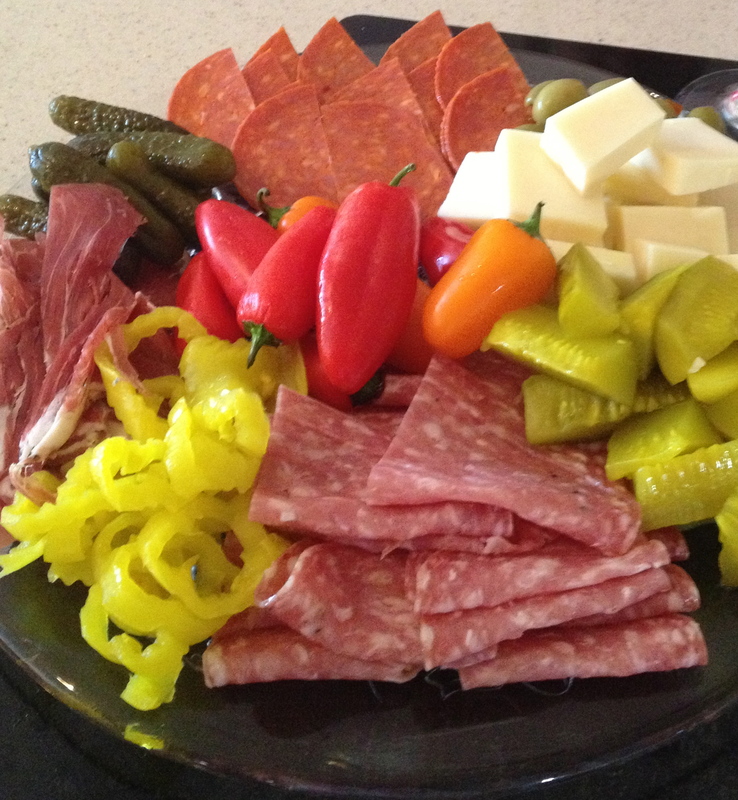 There is a variety of peppers, pickles, sharp cheddar, and some olives are hiding there too. Practically zero carbs and oh so yummy. I have followed the 8 Greats for Less Weight for 7 days now. Here are the results so far and my thoughts on the week. Stats- These are my average numbers for the week. I was NEVER hungry and waiting for my next unsatisfying meal like “diets” of the past. I looked forward to eating because of the yummy and great tasting foods I had to choose from. I ate butter, steak, bacon, raw nuts, avocados, and cheese without feeling guilty. All the years I tried to follow low-fat diets, I felt so hungry and deprived and never got to eat these foods. I decided on a “Freebee Friday” which was whatever I wanted for lunch on Friday. I had Five Guys; hamburger and french fries with a club soda (780 calories according to the Lose It! app). Let’s just stop and let that soak in for a minute……. I admit it. I ate that. It was only one meal and only for lunch. According to some sources it helps with weight loss to have a carb meal. This may not have been what they had in mind. I followed the “8 greats.” I ate lots and lots of veggies that were cooked in good oils, mixed with bacon, garlic, some cheese; not boring veggies. I focused on choosing foods from the “Heal Your Liver” food list. I drank lots of water and green tea and focused on working out 4 times (actually worked out 5 times) and getting my sleep. Most important, I watched my carb intake and kept it between 50-100. As you see from the stats above I averaged around 87g. Much lower on most days, but the Friday lunch bumped me up. As I looked back on my food diary I discovered that the 2 days that I ate a high protein breakfast, I was full longer, ate lunch later, and ate less of it. I tend to suffer from indigestion and digestion issues in general. No problems this week. I also experience some stiffness and a little pain in my feet and ankles in the morning. I had none of that this week. For more info on inflammation, joint pain and the connection with wheat, check out the book Wheat Belly. I only had wheat once. Remember Five Guys? I feel guilty every time I write that, but I gotta keep it real. If I was that kid on ‘The Middle,” I would whisper it now real soft…….five guys. The 1000 mg of vitamin C upset my stomach. I took it twice then stopped. Won’t be taking it next week. I haven’t incorporated the milk thistle or apple cider vinegar yet. Will add these next week. I bought some unsweetened cranberry juice to add to my apple cider vinegar shot for added health benefits. Going to find ways to shake Turmeric into my food. Not a spice I use, so need to be mindful of it for help with digestion and a healthy liver. Next check in on May 13. I have had this recipe for years and don’t recall who gave it to me. I am entering it into a cooking magazine contest that requires “spring crock pot recipes.” What is more springy than Cinco De Mayo?? Let me know what you think of it. Enjoy, and hand it down! Put the garlic, pepper, salt, chili powder, and mustard in a bowl and mix together. This will make a paste. Spread both sides of the meat with the paste. Place in crock pot and cover with onion, tomato, and beans. Low for 6 to 8 hours or until tender. 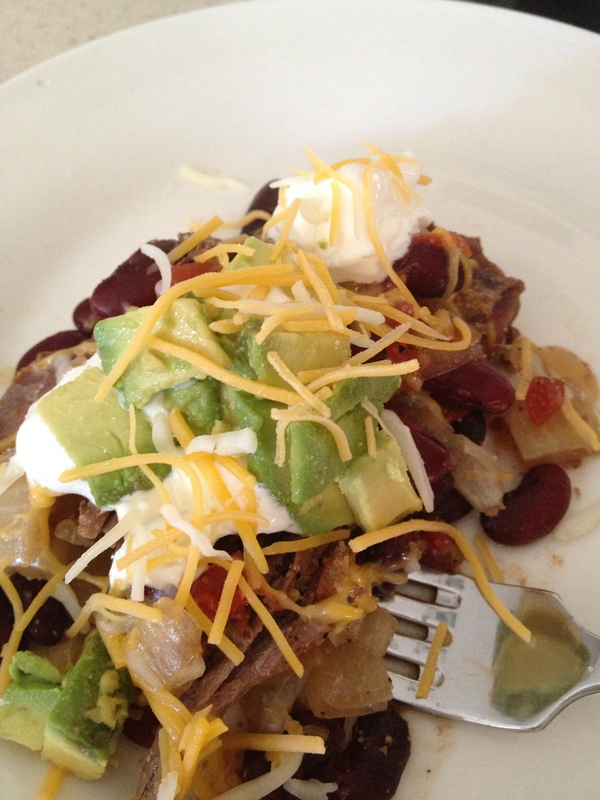 Serve alone or with sour cream, avocado, jalapenos, cheese….whatever you like. If eating grains, you can serve it on a bed of spanish rice.